New Subaru Legacy goes on sale in fall in U.S. The next-gen Legacy rides on Subaru’s 2-year-old global platform, gets an optional turbo engine, a stronger, more flexible body and more advanced infotainment. Subaru unveils a new-generation Legacy midsize sedan this morning at the Chicago auto show, promising a car that is safer and quieter inside than its predecessors, as well as more technology-laden. Subaru adds a turbocharged engine to the Legacy lineup for ’20. Standard in the XT grade, it is the first turbo mill in a Legacy since 2012. The 2.4L Boxer 4-cyl. hits 260 hp at 5,600 rpm and 277 lb.-ft. (376 Nm) of torque from 2,000-4,800-rpm. A 0-60 mph (0-97 km/h) time of 6.1 seconds is estimated with the 2.4L turbo four, mated to Subaru’s Lineartronic CVT. Estimated fuel economy for the engine is 24/32 mpg city/highway (9.8-7.4 L/100 km). The higher fuel economy partially can be credited to lower viscosity oil for the CVT hydraulic system, cutting horsepower loss 32% vs. the outgoing Legacy, Subaru says. The next-gen sedan’s standard engine is a revised version of Subaru’s naturally aspirated 2.5L Boxer 4-cyl., launched in the ’19 Forester CUV. Subaru says 90% of the 2.5L’s parts are new. The direct-injected mill makes 182 hp at 5,800 rpm and 176 lb.-ft. (239 Nm) of torque at 4,400 rpm. It also is mated to a CVT, has an estimated 0-60-mph time of 8.4 seconds and estimated fuel economy of 27/35 city/highway (8.7-6.7 L/100 km), the latter due in part to standard active grille shutters that open and close for reduced drag. The ’19 Legacy’s premium engine, a 256-hp 3.6L Boxer 6-cyl., gets city/highway mpg of 20/28 (11.8-8.4 L/100 km), while the car with the current-gen 2.5L Boxer 4-cyl. making 175 hp gets 25/34 (9.4-6.9 L/100 km). Both are mated to a CVT. The Legacy’s suspension is described as all-new, with new internal rebound springs and a new 23-mm hollow stabilizer bar on the MacPherson strut front suspension and a new 19-mm hollow stabilizer bar featured on the double-wishbone rear suspension. Brakes are 4-wheel ventilated discs and tires are either 17- or 18-in. on alloy wheels. As Subaru continues to modernize its infotainment, the ’20 Legacy has the largest screen yet in a vehicle by the brand: a tablet-style 11.6-in. (29-cm) full HD display with controls for vehicle settings, multimedia and heating, ventilation and air conditioning. The screen, standard on Premium, Sport and Limited grades of the sedan, allows users to rearrange icons to suit their preferences. A top-of-the-line display screen, optional on Premium, Sport and Limited grades and standard on Legacy’s Touring grade, has navigation powered by TomTom. The screen also can be configured to show a split of information – for instance audio and navigation – and is another Subaru first, the automaker says. The Base grade’s infotainment screen also is updated with a dual 7-in. (18-cm) wide video graphics array (WVGA) splitting multimedia and HVAC information. The Legacy for the first time gets available Wi-Fi connectivity, via an LTE network, and has four USB ports, one auxiliary jack and, in all but the Base grade, two 12V DC sockets. 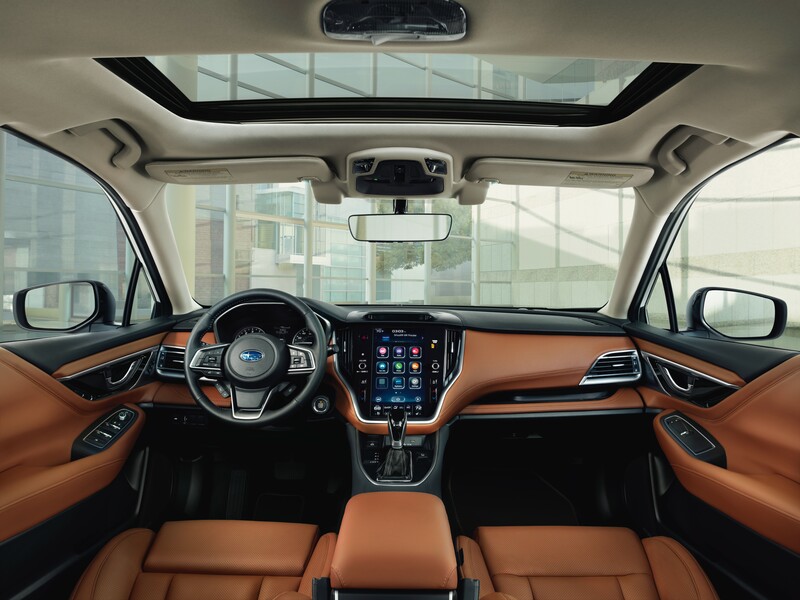 Interior materials (interior pictured below) include soft-touch and real double-stitching, on a new multilayer instrument panel and on seats and door trim, Subaru says. Front and rear heated seats are standard or available depending on the grade, with coverage up to shoulder areas of seatbacks now included. Ventilated front seats and a heated steering wheel are standard on the Touring grade and optional on the Limited Legacy. The Touring is the first Legacy to be offered with a Nappa leather interior, while the Sport grade gets aluminum pedals and red accents. Subaru says rear legroom is up in the Legacy vs. the ’19 model, as is front and rear hip room. Audio systems vary across grades, with a 12-speaker Harman Kardon system the most premium sound system available. Riding on Subaru’s new global platform that debuted in 2017 with the Impreza compact car, the new Legacy has 70% more torsional and front-suspension rigidity than the outgoing 4-door’s platform. The new platform also is said to have a 100% stiffer rear subframe and 100% more lateral flexural rigidity. Ultra-high-tensile-strength steel content is up 13% against the ’19 Legacy and there is a 371% increase in structural adhesive use compared with an initial iteration of the new platform, Subaru says. It also has two Subaru firsts: a floor crossmember filled with 2-part foam material and fuller inner frame construction. In the latter process, the outer panels are welded to the structure after assembly of the body framework. Subaru says this makes for a stiffer and lighter structure than the structure bestowed by the current Legacy’s manufacturing process. The new Legacy body also is claimed to absorb more than 40% greater energy in a frontal or side collision than the outgoing model. There are eight standard airbags, including a driver’s knee airbag. The automaker says drivers should notice more responsive steering and handling, as well as a smoother and quieter ride due to the stiffer new platform. Helping to cut cabin noise by nearly 3 dB at highway speeds is new weather stripping around doors (with a mid-section baffle and dual roof-side lips) and sound-insulated windshield and front-door glass. The automaker says the Legacy’s exterior gives the car an in-motion look, even when parked. Both the Sport grade and new Touring grade have glossy black exterior trim. The new ’20 Legacy arrives at Subaru dealers this fall. With the rising trend toward CUVs in the U.S., sales of the outgoing model fell 19.5% in 2018, Wards Intelligence data shows, just a bit steeper a loss than the 15.5% decline seen in the Lower Middle Car segment where the Legacy and competitors the Honda Accord, Ford Fusion and Toyota Camry live. Due to falling sales, Ford has announced the Fusion will be exiting the midsize-sedan segment in the U.S. when the current generation ends production.